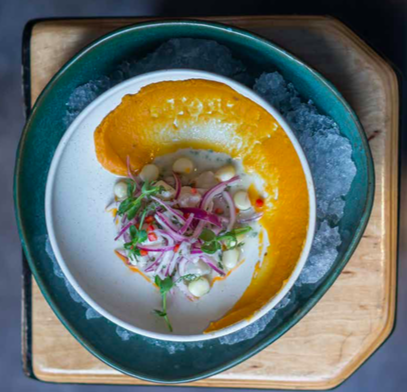 Journey Latin America through your palette at Picada, a Latin restaurant and bar that celebrates the diversity of Latin culture. Overlooking the buzzing streets of Lan Kwai Fong, the colourful space and hidden terrace oasis invites you in to escape the crowds and enjoy artfully crafted food, specialty drinks, live music and great company. The creative menu will take diners on a culinary expedition through Latin America with iconic flavours and dishes from each country - a veritable “picada” (share platter) of Latin cuisine. Visit the lively team at Picada, the heart of Latin gastronomy and culture in Hong Kong, for lunch, dinner, drinks & dancing. Live the Latin life of music, family, friends and delicious food. Everything at Picada has been made to share: our jarras menu, Picada platters, and of course- our dance floor! Whatever the occasion, come share the good times and the memories with us. Buy 1 Get 1 on Mains - A fantastic selection of 9 different Latino inspired main courses that will make your mouth water and your brain struggle as it tries to choose just one. Latin Thursdays! Frankie the Salsaman, who will be conducting an intermediate salsa class at 8:30pm on the terrace. Friday Fiesta featuring your favourite Dj's starting at 9:30 pm. Latin Party starts at 10:30pm, Dance with the hottest latin hits, with some exquisite Cocktails! Weekend Latin Brunch Menu For only $298 for 5 a course meal & add 198 for a freeflow cocktails! Make Picada your place to party! We cater to all occasions, whether it be a birthday, anniversary, a big night out, or a wedding reception. Picada has different menus to match your budget and taste. We have gluten free & vegetarian options as well as allergy free selections. make private enquiries for more details. BOOM Asia featuring Picada at the Beach!